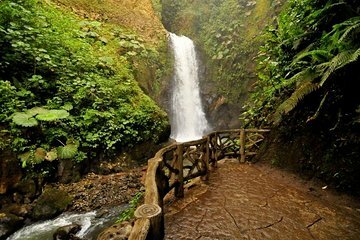 Discover La Paz Waterfall Gardens on this all-day guided tour. The popular natural attraction boasts five waterfalls, a cloud forest, rainforest, an aviary and butterfly observatory, and more, plus capuchin and black-handed spider monkeys and plenty of educational animal exhibits with jaguars, pumas, ocelots, and margays. Plus, visit the largest coffee plantation in Costa Rica and learn about its production.